Police said they were suspected in a car theft. 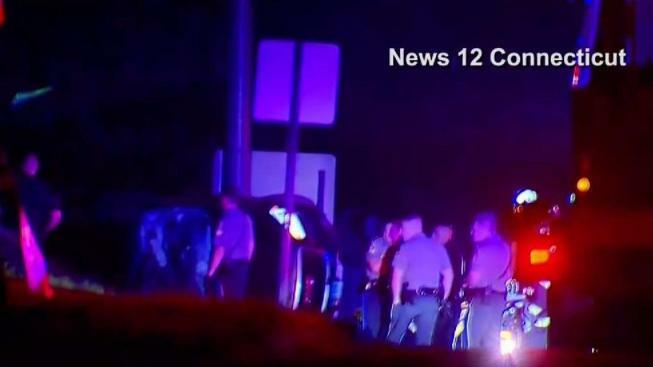 Seven juveniles from New Haven have been arrested in connection with a stolen vehicle case and police chase that started in Westport and ended in a crash Norwalk early Wednesday morning, according to police. Westport police said they responded to Chapel Hill Road around 3:30 a.m. to investigate a report of a motor vehicle theft and saw a gray GMC Acadia speeding on West Parish Road. An officer tried to stop the vehicle, but the driver sped off onto the Post Road and tried to hit two police vehicles, police said. The officers were able to avoid the crash and the chase continued west on Post Road East, where Westport officers ended the pursuit because the speeds were high and the pursuit was dangerous, police said. Norwalk police got involved when Westport police contacted them at 3:42 a.m. after the stolen vehicle fled along Route 1, police said. A Norwalk patrol officer who saw the GMC on Westport Avenue near Dry Hill Road tried to stop the vehicle, but the driver sped and turned off the headlights, at which point the officer lost sight of the stolen vehicle but broadcast a description and a last know direction of travel, according to police. Moments later, officers saw the vehicle on the Route 7 connector without the headlights on and tried to catch up to it, but they lost sight of it near exit 3, police said. When officers arrived at the end the Route 7 Connector, they saw the vehicle on its side along the shoulder of Grist Mill Road and two boys who were outside the vehicle were arrested. Five more male juveniles were arrested after getting out of the car, according to police. The juveniles were evaluated but none were injured. Police said four of the boys were wanted in New Haven and one had been reported missing from New Haven. One juvenile was charged with first-degree larceny, conspiracy to commit larceny in the first degree, interfering with a police officer, reckless operation, engaging in a pursuit and operating without a license. The other six juveniles were charged with first-degree larceny, conspiracy to commit larceny in the first degree and Interfering. Grist Mill Road was closed from around 4 a.m. to 7 p.m. for the investigation.